Following his sensational second round knockout victory, over Bosnian Jasmin Vrskic at the Dolmen Spa and Hotel resort in Malta on August 30th, Pieta, Malta’s ‘Super’ Steve Martin is preparing to travel to London, to defend his WBU International Lightweight title, at the Dave Murphy Acourtier Events promoted ‘NIGHT OF CHAMPIONS’ mega fourteen fight event at York Hall in Bethnal Green, London on Friday 4th October. Steve is no stranger to fighting on British soil, having fought in Scotland and Northern England during the early part of his career - the last being a sensational all action Battle Royale with Hartlepool prospect Callum Wilton, in July last year, the bout was so closely fought that Referee Andrew Right was unable to split them, electing to score the contest a 38-38 draw. Following a change of coach, to TRAD TKO’s Barry Smith, just days after the battle with Wilton, Steve has been in truly sensational form, stopping all five of his opponents since making the switch. The first came just one month later, when Steve stopped Germany’s Patryk Wolke in the third. Off the back of this victory Steve’s management began negotiations to challenge Sabri Ulas Goecmen for the WBU International crown, which took place at the Prembroke Arena, Prembroke, Malta in December. 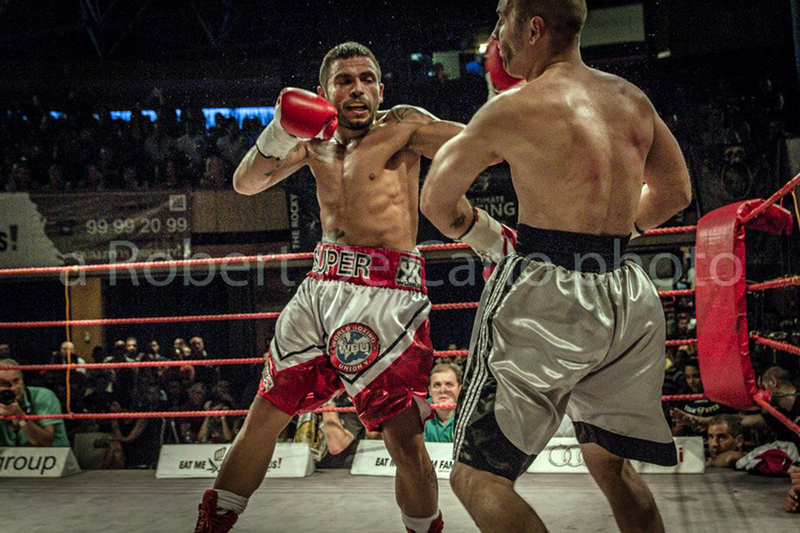 Throughout the bout Steve demonstrated the power that ‘Smithy’ had bought to his game, before stopping the tough German in the fifth to secure his first title. In the contracted title rematch, which took place in May this year, Steve went one step further, knocking out the Goecmen in the second round. Since then Steve secured a third round TKO over tough Bosnian opponent Adnan Zilic in July and, as previously mentioned, in his most recent bout stopped Zilic’s fellow countryman Jasmin Vrskic in the second round. Following another gruelling training session at the Fight Factory Gym in Marsa, Malta, Steve was clearly pleased to be returning to the UK to defend his crown. “I'm grateful that Dave Murphy and Acourtier Events are giving me this opportunity to come back to the UK and fight. To be on such a fantastic fight card is really exciting, it’s truly an honour to defend my title on a card alongside so many World class fighters, such as Graham Earl, Mark Prince, Michel Trabant and Jennifer Retzke. I am blessed to have a British coach wanting to work and spend his time training me, it's a dream come true. Steve’s manager Marc James then added. “Steve is on top form at the moment and seems to be in his climax of his condition. This is thanks to Coach Barry ‘Smithy’ Smith of London’s TRAD TKO Boxing Gym. Steve is looking forward to stepping back into the UK after Smithy has had the chance to work with him here in Malta for the past 5 weeks. 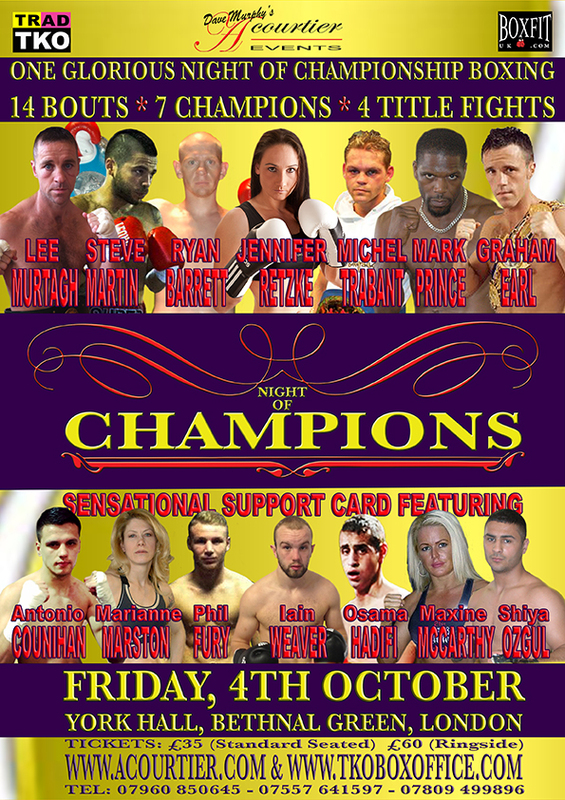 Tickets, priced £35 (Standard Seated) and £60 (Ringside) are available on-line at www.tkoboxoffice.com - www.mariannemarston.com - www.acourtier.com - or in person from the TRAD TKO Boxing Gym in Canning town – www.tkoboxinggym.com - and Ringtone Gym in Euston - www.ringtonehealthandfitness.com - or from any of the boxers taking part in the event, or call – 07960 850645, 07809 499896 or 07557 641597 for further information.